In most cases, people really don’t like changes. The reasons for such an attitude may vary: there can be misunderstanding about the importance of changes, lack of experience and knowledge, fear of the unknown, or all together. Unfortunately, this leads to misconceptions and wrong conclusions about changes. As you may have gathered by the headline of the article, today we’ll address the fallacies that apply to electronic signatures. According to P&S Market Research, by the year 2023 the global market of eSignatures is going to reach $9,073.1 million. Its Compound Annual Growth Rate (CAGR) is expected to be at 34,7%. Such growth rate will be driven by an increasing demand for security and a necessity to sign a growing number of digital documents. Despite the fact that this topic is gaining popularity, many people have surprisingly little experience with electronic signatures. This raises a number of questions and myths. So let’s debunk them together with KeepSolid Sign team. It’s true that some applications allow you to add your signature in this way. However, this is not a prerequisite. In a nutshell, electronic signature is a unique encrypted code which identifies you as a signatory. It is data in digital form that’s created in order to get rid from print-and-scan routine. 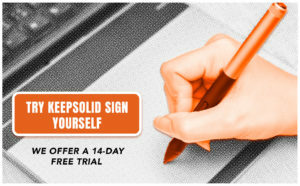 You don’t have to scan your handwritten signature when you can easily add it right within KeepSolid Sign application using a touchpad on your laptop, smartphone, tablet, or with a computer mouse. Not at all. There are two main types of electronic signatures: simple electronic signature and digital signature. The latter is the kind of eSignature that is based on a special cryptographic protocol. The main difference from simple ones is that such signatures don’t need to be supported by extra evidence in court. KeepSolid Sign, in turn, can serve as an example of a simple electronic signature with enhanced level of security. In 2000, eSignatures were given the same legal standing as handwritten signatures in the US. On July 1st, 2016, the same was done in the EU. If you are curious about other countries’ position, you can learn more in our detailed infographics about the legality of eSignatures. 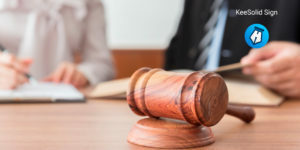 Spoiler: according to aforementioned facts and our research, we can state that electronic signature technology is predominantly legal, but each particular country may have its’ own conditions. This myth mostly comes from a misconception that working with paper and handwritten signature is safer. However, the truth is that working with paper is merely more habitual. The official stamp makes the document legally protected, but not physically. It doesn’t guarantee you the absence of data leakage. Moreover, if something happens to a paper document, it will take you enormous amount of time to re-establish it. In order not to let this happen and to keep your personal data completely secure, KeepSolid Sign team implemented PGP encryption. This technology leaves no chance for unauthorized parties to decode your sensitive information and tightly protects it. It is not at all like that. KeepSolid Sign, for instance, has one of the most user-friendly interfaces out there, dressed with intuitive functionality. In our app, you can collaborate with other participants, track documents status, add annotations, and even work offline. With our easy-to-use software, signing your contracts won’t take any more than a few minutes. Helpful tutorial and how-to guides are also included. Well, companies have to sustain the development of new security systems and maintain servers, so there is a price tag on most electronic signature apps. However, let’s ponder for a minute and recall how much money you spend on paper, printers, faxes, ink, scanners, and services for physical paperwork. This all usually adds up quite a bit. And this sum is obviously much higher than KeepSolid Sign’s monthly subscription, as you can check for yourself. In the end, we hope our team managed to dispel these most popular myths about electronic signatures. If you know other examples of such biases, let’s discuss them in the comments below!